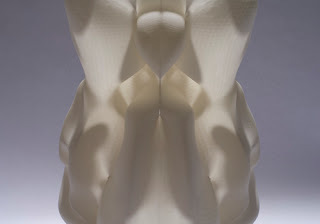 MATERIALECOLOGY's most recent work entitled Natural Artifice will be exhibited at the Design and the Elastic Mind exhibition at the Museum of Modern Art to open Feb 24th in NY. The work celebrates the practice of Design as Life Science across scales of performance and production, as well as exploring new forms of disruptive technologies. Stay tuned and aglow for a new website showcasing the artifacts and the inspiration. The work has been supported by the MIT School of Architecture and Planning, the Media Lab and the Design Lab at MIT. A detailed sponsor list will accompany each of my pieces in the exhibit. The show is curated by Paola Antonelli, Senior Curator, and Patricia Juncosa, Curatorial Assistant, Department of Architecture and Design, the Museum of Modern Art. The exhibit will last Feb 24th till May 12th and will be accompanied by a fully illustrated catalogue.